Output per annum Music contributes as much as 15 % of individual earnings in the Film Industry. The history of Indian Music is from the ancient day of 3rd and 2nd millennia BC, during the Indus valley civilizations. Indian music is based on rhythms and melodies but more importantly it is more concerned with vibrant colors of the rich musical heritage and a wide range of vivid emotions and expressions. Many Archaeological studies are the evidences and give validated presence of several musical instruments like harps and drums during the era. According to the Indian mythology, the laws of music was revealed known to Narada, the first sage. It is being believed that Tumburu was the first singer and Goddess of music and learning is Saraswati. Between 200 BC and 200 AD, Bharata created Natyashastra or the rules for theatre between, which also focused on music. It included descriptions of various classes of instruments like the Gandharva music and Talas which are the rhythmic element of Indian music. The period during 300 AD to 600 AD which is the Gupta Period was marked by the masterpieces created by Kalidasa, a lyrical poet and a writer of great epics and plays. The period of 600 AD to 1200 AD, was mainly of emergence of the regional music, classical Hinudstani music and which was also influenced by Islamic music. The first major text describing ragas was written by Matanga and was known as Brihaddeshi, which literally means 'The Great Treatise on the Regional'. 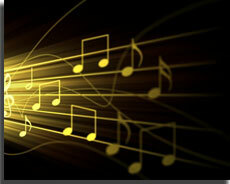 Brishaddeshi also introduced the sargam which is the musical notation in Indian music. From 1200 AD to 1700 AD there were several other benchmarks in Indian music including the maestro Khusro who composed verses in Persian, Turkish, Arabic, Braj Bhasha, Hindawi and Khadi Boli. He also was invented qawali, qasida, qalbana, naqsh and many others forms of Indian music and is being said to have created a new system of musicology, called 'Indraprastha Mata' or 'Chaturdandi Sampradaya' and brought into circulation the two unique musical genres called 'tarana' and 'kaul'. History of Indian music during the 800 BC was called the Bhakti revolution. This period belonged to the saint poets like Tulsidas and Kabir. Then there was the emergence of several music streams like Ashtachap and Haveli Sangeet. Music was prominent during Emperor Akbar's court and came from the text Ain- e -Akbari which mentions the rich music culture of Akbar's time. The instruments used were like sarmandal, bin, nay, karna and tanpura. 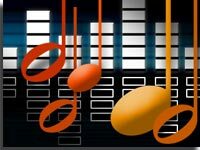 Indian Music Industry was established on 28th Feb 1936 and is the Second oldest music companies' associations in the world engaged in defending, preserving and developing the music and actively promoting by encouraging advancement of creativity and culture through sound recordings. Indian Music Industry members includes major record companies like Saregama India Ltd. (HMV), Tips, Venus, Universal Music (India), Sony BMG Music Entertainment (India), Crescendo, Virgin Records, Magnasound, Milestone, Times Music and several other prominent national and Regional labels that represent over 75 % of the output in legitimate recordings and a wide range of musical repertoire. Indian Music Industry has a rich musical tradition and is capable of generating sizeable revenue for the country in every genre of the music industry. There are log of loopholes in the industry due to the unabated growth of piracy. Raids spanning the length and breadth of the country, the Indian music industry has lost of over Rs. 1800 crores in the past three years.There are registered offices in Kolkata, Mumbai, New Delhi, Chennai, Bangalore and several other cities, towns across India focusing on surveillance, law enforcement and intelligence teams. Indian Music Industry is now working with newer strategies and better infrastructure to reach and strike at the very roots of piracy in India. Indian Music Industry along with MTV launched the first music awards in India, THE IMMIES which has been having a resounding success. The objectives of the award were to reward music talent. Indian Classical music is usually dividend into two broad categories namely the Hindustani music and the Carnatic music. The Carnatic music has its traditions from the southern part of the Indian subcontinent which emphasizes on vocals. While the Hindustani music is a traditional form from North India. The bases of the Hindustani classical music include melodic modes that are a part of the ragas. Hindustani music is based on the basic system called sargam which is similar to the Western solfege, thus the Indian sa, re, ga, ma, pa, dha, ni corresponds to the western do, re, mi, fa, so, la, ti. Folk music usually comes from the rural lands, emerging from various regions of India, which are distinctive and are embedded with a strong element of the regional culture. Bhavageete which literally signifies as a emotional poetry is quite popular in India especially in Karnataka and Maharashtra. Another popular genre in Indian folk music is the Punjabi Bhangra done by farmers to celebrate the spring season that marks the time of harvest. There are various folk music of Maharashtra are called Lavani and Gaulan and the Dandiya music from Gujrat and the Baul from Bengal. Indian pop music is a mixture of almost everything like folk, classical, and even western music beats. Some of the pop singers include Usha Utthup, Peenaz Masani Sharon Prabhakar from the early nineties. Other successive generation of pop singers include the Baba Sehgal, Alisha Chinai, Shaan, Sagarika, Lucky Ali, and Sonu Nigam. The music of Indian films has always been popular & full of entertainment for their song and dance sequences they produce. Music has been a crucial part of Indian movies right from the beginning. The popularity of music in Indian films is such that almost every filmmaker incorporates at least four to five songs in the movies which is enjoyed by one and all. Music is the main important part of Indian film industry. Music contributes as much as 15% of an individual earnings in the Film Industry. The industry analyzers and estimatations say approximately 15 crores of unit sales of music cassettes and cds in a year, with an average realization of Rs.40-45 crores. Which brings the size of the industry of the music industry to about Rs.670 crores though piracy will continue to hamper the growth of the industry, Indian music industry was expected to touch Rs.777 crores by 2009 which has to great extent has been satisfactory. Indian Music Industry today currently stands at INR 10.4 billion. 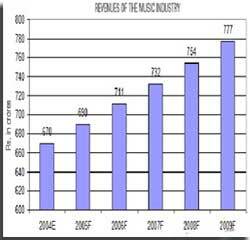 Till the last decade the Indian music industry at INR 18 billion (GBP) has more than doubled. The total Indian music cassette (MC) market constitutes 95% while the compact disc (CD) market is 5% in volume terms. India has become increased significantly in the global economic arena - it is known to be the world's fourth largest economy in PPP (purchasing power parity) terms and is a strong founding member of the WTO. India is amongst the world's top five fastest growing economies, with real GDP growth at around 5.5% for the some years. Like the wide variety of forms in music like classical, folk, jazz, pop, fusion etc there are a variety of opportunities in the Indian Music Industry like the performer (vocal or instrumental) or a teacher, composer/song writer, music publisher, music journalist, Disc Jockeys/ Video Jockeys, Music Therapist, Artist manager/PR. Today Indian Music Industry has undergone a complete change with the process of internationalization. The Music Industry today reaches every nook and corner all over the world reaching the Indian and even Non Indians. This mainly is due to the Retail revolution in music distribution and increased penetration of CDs. Initiativs taken by the government of Impending radio privatization which would de-regulate radio frequencies, assigning 150 new FM stations to an industry which, up until now, has benefited from less than 10 radios broadcasting music hit. Even Promotion of music is done by the way of satellite music channels like the one of Indian versions of MTV and News Corp's and majority of them own local channel V.
Exports of Indian film soundtracks to around the world listeners that are expected to keep on growing overseas. For example the film music of Kuch Kuch Hota Hai sold over 200 0000 units in 20 countries.